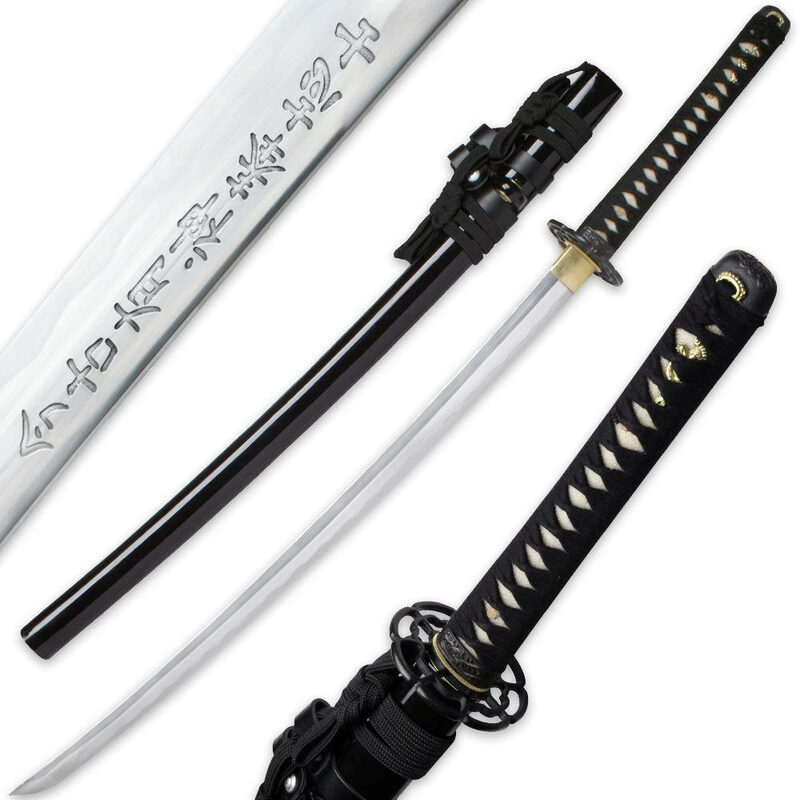 Excellent quality Last Samurai sword with 1065 high carbon steel blade. This model offers a heavier blade than our other Last Samurai models due to not having a blood groove (bo-hi). Extremely sharp, this sword is fully functional, full tang, and can be taken apart for care. Handmade & fully functional katana sword. Full tang construction w/ dual bamboo pegs. 1065 High carbon steel blade. Heat treated / tempered blade. Real ray skin lined handle. High gloss lacquered wooden scabbard. 28 in. blade, 40 in. overall. This is a beautiful sword made out of 1065 carbon steel it's very well balanced and very sharp. Slices 2 liter bottles 3-4 times with out moving the bottle. Sword arrived duller than most my kitchen knives. Failed the basic paper cutting test. Tight fittings but upon fully dismantling the sword I found rust underneath the habaki. After removing the rust and sharpening it myself I am pleased with the look and weight of this sword. The one major plus is how quick the shipping occurred. Ordered Sunday night and arrived on Thursday with standard shipping cost. This katana is awesome. It has a razor sharp edge and it has tight fittings. It is one solid sword. I wasn't expecting that much out of a $90 sword but it is awesome! I highly recommend it. Ten Ryu is not my favorite sword maker. I didn't know this sword was made by them since it never says it on the web site but mine came with a Ten Ryu label on a string attached to the tsuba. The saya fits the blade way too loose. It just falls right off the sword. The hamon on this sword is too perfect to be handmade and makes the blade look machined. For the price it's a decent practice sword that I can tear up slicing stuff in the back yard. Handmade Last Samurai Sword and a couple of other things. I called to check on the delivery time because this was a birthday present. I received a call back with in 30 minutes. He said everything I ordered would be delivered on time. I ordered on a Tuesday and I received on Thursday. Everything I ordered was perfect. The sword was beautiful! I will order from here every time on the future. I placed my order (several items) on Sunday and I received this Samurai Sword (along with all items) on Wednesday. It came nicely packed, plenty of thick oil on it and was in great condition. It appears solidly constructed, and has a nicely defined hamon. Initially I thought it will be a showpiece, but it appears to be battle ready. Not sure how I will use it, but I am anxious to continue to work on my technique and cut a few melons. Over the next few days, I will thoroughly clean it and proudly display it in my home office. Also, I might add that I did a fair bit of research and read a few negative comments but when my sword arrived, I was extremely happy. Very Happy with this sword! I just received my sword about 30 minutes ago, beautiful! That's the first word that comes to mind, everything on this sword is, in my humble opinion, exceptional. The fit and finish are outstanding! Everything is tight, and razor sharp! You're getting a lot of quality for you money. I could go on and on, but why? Buy one for yourself, you'll see what I'm talking about. Oh yeah, and as usual True Swords' shipping dept. came through once again, I ordered Wednesday afternoon, got it today, and we had Thankgiving in between! You truly can not go wrong with these people! Amazing customer service. Received the Katana and it was everything I hoped it would be. Tested it and was beyond expectations. I will be ordering from here much more in the near future. I have my eye on a few things already. True swords has the best customer service I've had with anything I've purchased online, and I do purchase quite a bit online being that I'm out in the country. Thank you True Swords.